Our nation’s not-for-profit housing, community-based and long-term care service providers are on a mission. Their objective: to provide the highest quality and the most compassionate care to those they serve. By continuing a tradition of mission-driven, consumer-centered management and competent hands-on care, not-for-profits set the standard in the older American housing and service continuum. Not-for-profit organizations manage their financial resources in accordance with their missions. Many not-for-profit housing and service providers were founded by faith-based and civic groups of rich tradition, and their longstanding values are still reflected in their governance and management. They are not driven by a daily pressure to increase their bottom line for owners, investors or shareholders. Quality, rather, is the barometer of a not-for-profit organization’s efforts. Not-for-profit organizations are accountable to voluntary boards of directors, who donate their time and talent to ensure that ethical management, financial integrity and quality services are maintained. Not-for-profit finances are always open for public inspection. With such information readily available on the Internet, the information is literally at consumers’ fingertips. Not-for-profits have a responsibility to be active, contributing members of their localities. Not-for-profit providers have a longstanding tradition of leading with quality. 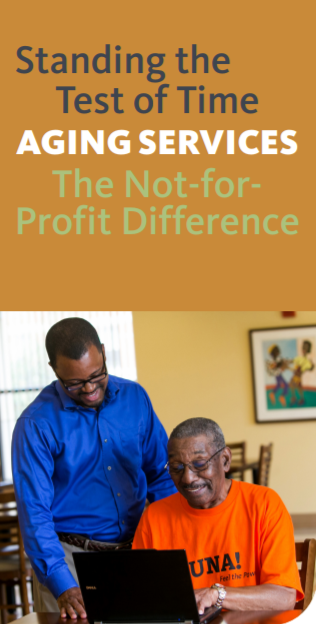 A review, in combination with statistical contrasting and combining results from 82 studies that compared not-for-profit and for-profit nursing homes, found that not-for-profit aging services organizations produced superior outcomes on the several quality measures. Download this handy brochure to learn more.